Influenza A viruses are responsible for recurrent flu epidemics and occasional severe pandemics, and remain a significant cause of morbidity and mortality. Evolution of seasonal viruses and emergence of pandemic viruses are greatly facilitated by the IAVs segmented genome consisting of 8 (-) sense RNAs (vRNAs) [1,2], which allows rapid evolution by genetic reassortment but complicates its assembly, as IAVs must incorporate at least one copy of each vRNA to be infectious. 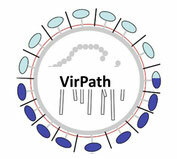 The prevailing consensus is that vRNAs are selectively packaged into budding virions . This model has important implications for genetic reassortment and for the design and production of vaccines, yet little is known about the molecular mechanisms underlying specific packaging and the cis-acting packaging signals in vRNAs have only been incompletely delineated. The goal of our research is to investigate and contribute to more deciphering the molecular mechanisms that govern the specific packaging of all 8 IAV genome segments [4,5]. In an on-going collaboration with Dr Roland Marquet team (UPR9002 CNRS, Strasbourg) to address this issue, we combined in vitro assays with virology approaches and electron tomography to demonstrate that the 8 vRNAs of IAVs build up a single network of interactions. Importantly, we further showed that an in vitro identified vRNA/vRNA interaction is required for optimal replication of the H5N2 IAV and is involved in the selective co-packaging of the interacting vRNAs . This is the strongest evidence so far indicating that the “vRNA/vRNA interaction hypothesis” is correct. In this way, our aim is to extensively and precisely define the vRNA primary and secondary structures of all the cis-acting IAV packaging signals, by using a multidisciplinary approach combining molecular biology, virology and microscopy in collaboration with Dr Patrick Bron team (INSERM U1054 / CNRS UMR5048, Montpellier). First, we will apply an innovative systems biology approach (MIME) based on the random mutation of each nucleotide of each vRNA and selection of the functional molecules by the viral machinery itself, to define the structure elements of each vRNA important for packaging. We will then identify and validate intermolecular vRNA/vRNA interactions and test their functional role in viral replication, co-packaging and assembly, using in vitro, in cellulo and in viro approaches. Finally, the robustness of the vRNA interaction network will be tested by electron tomography. Our ultimate goal is to understand the rules underlying genetic reassortment of IAVs. This research will help to evaluate the likelihood of generating reassortant viruses, including those with pandemic potential. We will focus on influenza strains used in the industrial process of vaccine production. By the way, we already demonstrated that genetic reassortment is strongly restricted by sub-optimal compatibility between the vRNA packaging signals of divergent IAVs . Successful completion of this project should also pave the way for improving the generation, selection and replication of reassortant viruses used for vaccine production. 1. Palese P et al., Fields Virology, D.M. Knipe et al., Editors, 2006. 2. Hutchinson EC et al., Genome packaging in influenza A virus, J Gen Virol., 2010. 3. Fujii Y et al., Selective incorporation of influenza virus RNA segments into virions, Proc Natl Acad Sci USA, 2003. 4. Noda T et al., Packaging of influenza virus genome: robustness of selection, Proc Natl Acad Sci USA, 2012. 5. Wong SS et al., Traditional and new influenza vaccines, Clin Microbiol Rev., 2013. 6. Gavazzi C et al., A functional sequence-specific interaction between influenza A virus genomic RNA segments, Proc Natl Acad Sci USA, 2013. 7. Essere et al., Critical role of segment-specific packaging signals in genetic reassortment of influenza A viruses, Proc Natl Acad Sci USA, 2013.